Magnethane™ is an exclusive blending of FDA and USDA approved metal detectable thermoplastic resins. This unique combination of materials creates a new family of industrial food grade conveyor belting products. The magnetic signature of these belts can be detected by most metal detection and X-Ray devices used on packaging and production lines. Magnethane™ products are the next generation of "safety net" products for progressive food manufacturers and packagers. Since Magnethane™ belts produce about half the tension of pure urethane belts, we recommend using larger diameters or thicknesses, where possible, and stretching it at least 12%. Also, the high concentration of magnetic detectable additive does not allow us to produce Super Strong Weld joints, so we cannot provide our warranty for weld strength. Since food applications are usually for conveying and not power transmission, our welds should be strong enough to work adequately in light duty conveying applications, but no warranty can be provided. Round profiles: 1/8", 5/32" 3/16" & 1/4" (3.2mm, 4mm, 5mm, 6.3mm) diameter. Flat profiles: 1mm, 1.5mm, 2mm, 3mm & 6mm thick by up to 26" (660mm) wide. (We can only weld up to 12" wide). Food grade FDA & USDA approved. 85A durometer opaque blue color. Also see Metal Detectable Belts. Warning: DuraBelt does not manufacture this material. The manufacturer asserts that the minimum size for detection is a 5/32" (4mm) round cord that is at least 1/4" (6.3mm) long, but detectors must be set to detect an iron ball of 2.5mm diameter or less. Pieces of cord smaller than that may not be detected. We have not verified this. 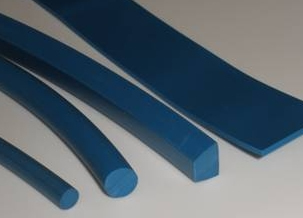 Also, since each material lot can very in magnetic detectability, and since detection equipment can also very in sensitivity, users should test a sample (the minimum size piece as described above) from each order to confirm that the material is detectable with their equipment before installing the belts. Metal Detection Systems that work well with our belts: Fortress Technology. For the best in magnetic metal detectable food grade (FDA & USDA approved) belts and belting, insist on Dura-Belt.